We once lived in a large, three - story, house in historic Hull Massachusetts. Nearby was property that was owned by the Kennedy family. At the time, I had three little children and was expecting my fourth. I was home almost all the time. I made our food from scratch in the large kitchen with its enormous picture window with an ocean view. Every morning, as the children and I sat at the breakfast table, we would watch the ships going by. This was an incredible home and we were blessed to have lived there, renting the property, for two winters. These days, we are in Vermont and my children are mostly grown. My youngest (of five) will be 18 this summer. Now there are five grandchildren to watch and to help care for. Three of those babies live here with us, while the other two visit now and then. All five of the babies, and five of the children were here over the Easter holidays and it was a lovely time. Yet, I am confined to home. I am confined to the nursery, yet again. I am caring full time for 2 little grandchildren (ages 2 and 1), here at our 2 acre Vermont Estate. I am much older now and cannot make all my food from scratch, or keep up with the housework, and take care of everyone without help. I get tired. I experience unbearable back pain (gentle smiles), and I need the naps just as much as the babies do! Sometimes, when I get overwhelmed with all the work - the loving guidance; the prayers and the lessons; the cheerful playtimes and stories; and the rocking of babies, I sit and write after they are asleep. Or I will look at photographs. This helps me see that we are not just living today, we are creating a history of our lives. We are living and enjoying our days, despite hardships. This makes me smile and brings great peace. Today, I was given permission to share just one picture of 2 of the grandbabies (from my daughter - their mother). I hope it will make you smile as you know that you are also often confined to home, and to your own nurseries. For baby and child care advice - Old Fashioned Motherhood. Happy days - Going out with Mister. Mrs. White's special book for Homemakers - "Mother's Book of Home Economics." I don't know how you do it, but you writing just soothes the soul. So glad to hear from you. I check almost daily to see if you are visiting. I love your blog and enjoy reading old post. It too am home to care for 2 little while their 3 older brothers are at school. Hello Mrs. White! So glad you've posted today. Enjoyed reading. The grands are precious! After I started baby sitting for one extremely active grandchild that would run every where, I embraced the family room where we stayed most the time. This room became my space to be busy with baby. At times I did feel so isolated and I grew to welcome this. I so love, love, love reading your posts. The stories you share, the vintage photos and the simplicity of the life you live, just takes me way back when times were simple...but grand, and when families showed how much they really cared about family and relationships. Thank you for sharing your thoughts, stories and your family with us. Truly inspiring! I well remember my days "confined to the nursery." Sometimes I felt snug and happy. Sometimes I felt sorry for myself and cut off from the world. Now, I look back on those days as precious and fleeting. That did make me smile. I'm so sorry to hear of your pain. I shall pray for you. God bless you and bring healing and relief of pain in Jesus' Name. Wishing you a very Happy Mother's Day!!! Happy Mother's Day to a wonderful Mother! Your gentle, womanly ways are an example and encouragement to all of us. It is much the same here with getting older and needing naps along with the grandchildren. We have the same red riding toy and grandson calls it the 'bikle'. 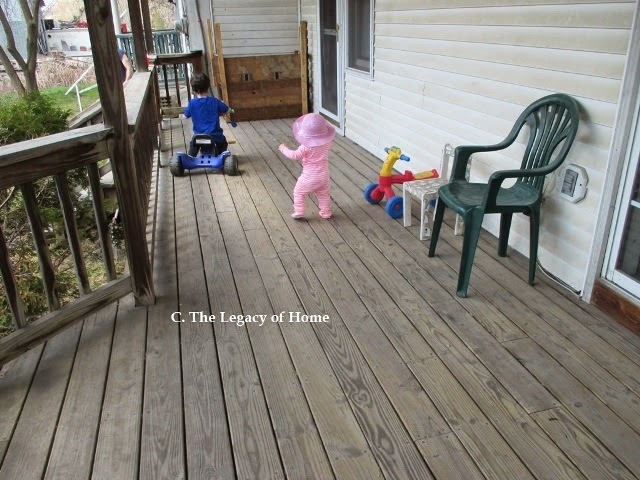 Ours play on our large deck and bubbles are very popular here as well. Enjoy these days. They are fleeting too as our oldest grandson turned 7 today and it seems like he was just born. Hello Mrs White, our lives are so similar. We lived where we had a view of the Pacific Ocean when my children were small. And now I am also very often "confined to the nursery" with grandchildren. Like the first commenter said, I find your writings so calming. Thank you. What a sweet picture! I'm glad that you were able to share it with us. You have such a peace about homemaking! I wish I could come visit you in your parlor and learn a thing or two! I'm in the trenches raising 5 precious boys 6, 4, 2 (almost 3), 19 mo and 7 mo.